New study shows that british tourists use oversized and missreplaced towels in an attempt to beat the Germans on the pool chair battle. This is an unfair method (“bad, very bad”) and will soon be stoped. British tourists are winning the sunlounger wars in Spain, waking up hours earlier than their rivals to secure a comfortable spot by the pool, an investigation into the habits of holidaymakers in Spain has revealed. 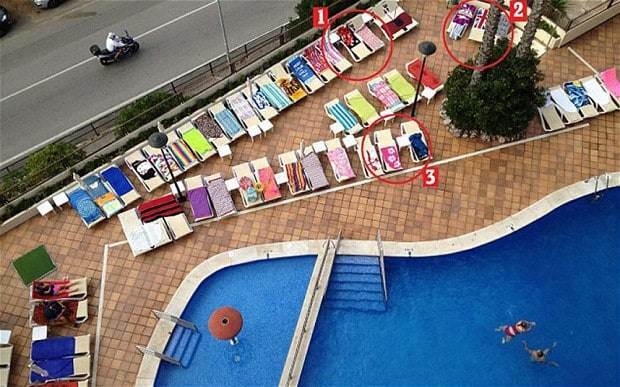 The Daily Mail observed British tourists at a resort in Alcudia, Majorca, who placed their towels on loungers to “reserve” them as early as 6am. 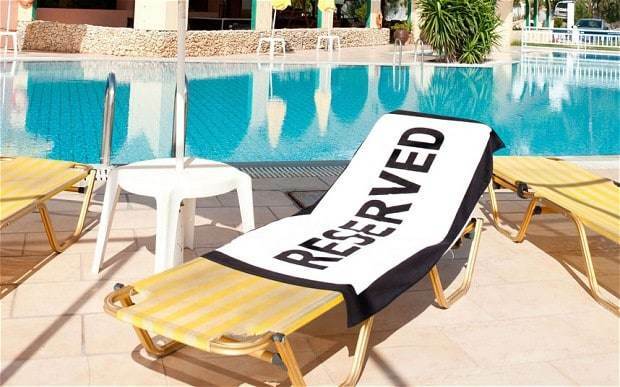 One Briton went the extra mile by using a towel with the word “reserved” on it. By 8.51am all of the loungers were taken, but the holidaymakers were nowhere to be seen, Bild wrote. The newspaper quoted Stephen from Barnsley, who reserved three loungers at the Bellevue Club hotel at 6am. He returned to the pool with his wife and son a full four hours later, ready to enjoy his prize. “Luckily, I’m an early bird,” he said. The investigation follows a similar operation last year, when the newspaper visited in Lloret de Mar on the Costa Brava. Then, not one tourist had laid down a towel by 7.36am, indicating that the towel wars have intensified in the past 12 months, forcing holidaymakers to wake up even earlier to secure a sunlounger. Bild said that the Germans and British were the “undisputed masters” of sunbed blocking, though its investigation identified only British sunlounger hogs. Two German tourists quoted, Sabrina and Kai, both teenagers, got there too late. “When we arrived everything was already taken,” Sabrina said. The paper called on readers to ask hotel management to remove towels because “no one has the right to a reserved lounger”. The investigation will surprise many British tourists, who complain that Germans usually beat them to the best loungers by waking early.